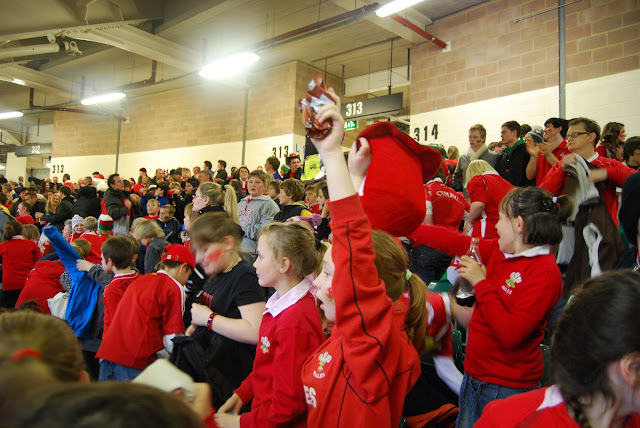 Here are the arrangements for our visit to the Wales v Samoa international at the Millennium Stadium on Friday 16th November 2012. 1. Please will you make sure your child is in school by 4.45 p.m.
2. The coach will leave Gelli Primary at 5.00 p.m. as we anticipate some heavy traffic on entering the city centre. 3. The coach will drop us off in the area where coaches are recommended to park by the police. The city centre areas are not open to traffic. 4. We should arrive in plenty of time to walk to the ground before the game, which kicks off at 7.30 p.m.
5. The game should finish at 9.15 and we will need to make our way to the coach park area outside the University buildings in Cathays Park. 6. It will take some time to make our way out of Cardiff through the traffic but we should be back in Gelli between 10.30 and 11.00 p.m.
We are NOT able to take any bags or other items into the ground, so I suggest that your child has a good meal before leaving and that we take a small bottle of water and a few sandwiches to eat on the way back on the bus. Please can we make sure that any litter is brought back with them in their backpack. In addition please can we NOT take chocolate, sweets, crisps, pasties, yoghurts or fizzy drinks etc that will make a mess on the bus. The children will be NOT NEED to take a mobile phones to contact you on the way home to update you on our time of arrival. I will use our Text to Parents facility to contact you when the bus will be in Porth which will give you about 10 minutes to make your way to school to pick your child up when the bus arrives. Please make sure that Mrs Thomas has your current mobile number in our system. Please will you arrange to pay the balance of the cost of the trip by WEDNESDAY 14th NOVEMBER unless you have already done so. We have an adult child ratio of 1:4 and your child will be allocated a member of staff to look after them. We will insist that your child listens to the member of staff at all times, follow instructions and co-operate at all times. · When we are walking to and from the bus we will hold hands so that children are not separated from each other. · There will be frequent head counts and staff will have each other’s contact numbers in case of emergency. · Children will be supervised at ALL times and accompanied to the toilets by members of staff. Also if your child needs to take an asthma pump with them that this is given to the teacher in charge of your child’s group and inform us. We will NOT be allowing the children to visit the cafes or bars inside the stadium. I suggest that the children only bring a maximum of £7.00 in coins so that they can buy a souvenir match programme if they wish to do so. There will be no other opportunity to spend money. There is NO NEED to wear school uniform. If your child has a Welsh Rugby Shirt or any other suitable item such as scarves, hats etc please bring them along. (There is no need to buy these specially!!) Please make sure that your chid has a warm, waterproof coat as we will be walking some distance from the bus to the stadium. I anticipate that we will have a wonderful experience next Friday and the Welsh team will run in plenty of tries and we will spend most of the evening cheering. The staff are experienced in supervising children in these situations and I expect that the children will be excellent ambassadors for Gelli Primary. If you wish to discuss any of these arrangements with me, please do not hesitate to contact me.